The rules themselves are rather easy to read and comprehend, but they're conceptually dense. There's a lot old work here, like rolling d20s early and often for nearly anything you need to do. You use the same old statistics - that's Wisdom, Constitution, and the others - for many of the same things. The skills system has been reworked to be a little more straightforward, but it's much the same. 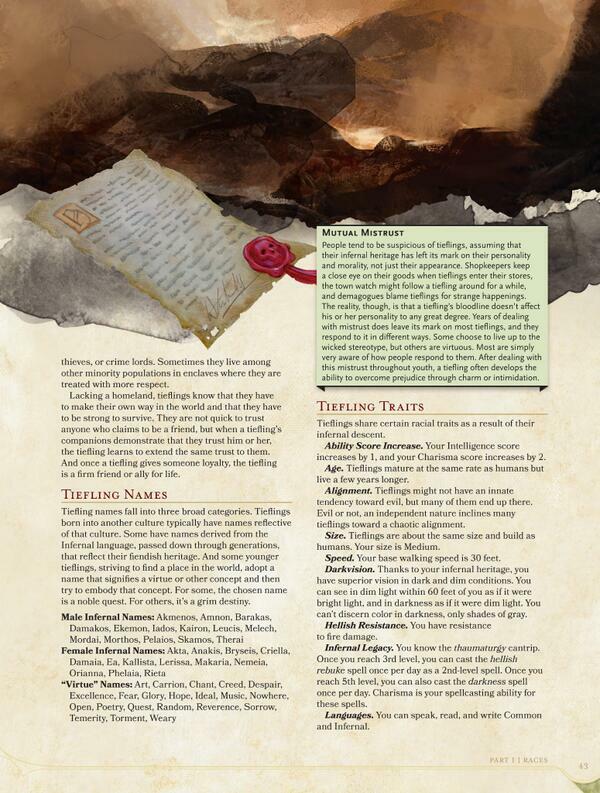 You've got a suite of useful adventuring rules, like who should roll to spot an enemy sneaking up on the party based on where every character is standing, or how light works in the dark depths of the earth. D&D is still a fat mechanical monster with lots of rules, far too many rules for a game that can be called truly quick - but its been streamlined quite a bit. Dungeons that would have taken five hours with 3rd or 4th editions of D&D or another fantasy system take half the time with this one. A lot of that streamlining was accomplished by cutting away the fat of the game. Characters now have a simple proficiency bonus that scales as they level. If a character is proficient in a task - say, stealth - they add that bonus to stealth checks they make. Each character is proficient in a handful of areas and might get a couple more over the course of play, but there's no fiddly deciding where to put individual skill points each level. 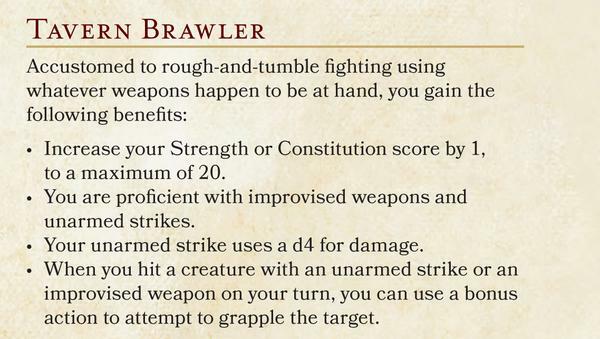 The very restrained nature of those modifiers, along with your character's limited ability score modifiers, allows the game to take place along a much narrower spectrum of numbers than some other editions of D&D have. Your 18 armor class is really good at 1st level and it's really still good at 10th level - that's stupendous. It keeps the game along a more comprehensible set of numbers which can be easily understood by people playing. That said, there's a certain problem with numbers you have that don't scale while others' do scale. Take, for example, players' saving throws. Saving throws are mapped to the six stats, so you have a Strength Save or a Dexterity Save. Your class makes you proficient in a handful of saves, and so as your proficiency bonus goes up those saves go up. The other saves? Well, they don't go up at all unless you put an ability boost into those statistics. Meanwhile, the number you have to make to resist your opponent's magic spell does go up over time. And you can be sure that monster's saves go up. It means certain characters are going to be very vulnerable to certain types of effects and magic - which might be quite frustrating if your group isn't working as a team and compensating for others' weaknesses. Two great new mechanics show up in the Player's Handbook, one a purely numerical conceit and the other a roleplaying reward - Inspiration. Inspiration is reward the game master gives you for playing to the bonds, flaws, and traits you said your character had during character creation. If you play those up at the table, make them part of your experience, or have them get you into some hot water, you get inspiration. Inspiration is a one-time reward you can cash in for advantage on a roll. Advantage is the other new mechanic, and definitely 5th Edition's killer feature. It's another fat cutter, that removes mechanical cruft from the game. That cruft? 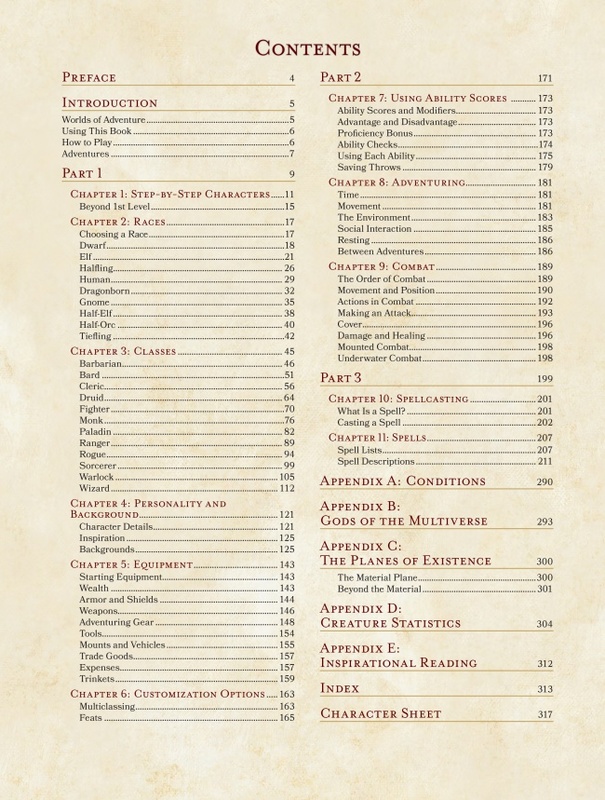 The mental checklist of modifiers that you had to go through before attacking in prior editions. Gone are the "Am I flanking? Am I on high ground? Is the target in partial concealment? Is the target armed with a tower shield?" questions that slowed down play. Now, you just have advantage or disadvantage. When you've got one or the other, you roll 2d20 on an attack or ability check and take the higher for advantage and the lower for disadvantage. The mechanics of advantage aren't perfect, they actually privilege someone who needs middling results to succeed. However, advantage speeds up the game so much that the lost granularity is a sacrifice players will be willing to make. That said, there's some oddness in the game still. Cover modifiers still exist, despite the existence of advantage. So you get a bonus to AC and Dexterity saves if you're in varying stages of hard protection - hiding behind an enemy, a log, or an arrow slit. It's literally one of the only things left to think about from that old mental checklist of modifiers - but there it is. Sticks out like a sore thumb. The game's half acceptance of grid-based play is its real failing. Everything is measured in feet, speeds are measured in feet, spells are shaped in cones and spheres - also measured in feet. Sure, there's a game here that you can play with a theater of the mind approach, without maps and miniatures. It's a fun one too, and a lot of the time you'll float right past the fine measurements and not worry about them - but odd situations will come up. Someone will describe placing a spell just right so they don't hit their friends. A combat in the woods will leave an archer confused about who they can and can't target. In the end, you can't get away from the desire to map it all out. To put down buttons or dice or plastic goblins and see what the precise measurement would come out to. There's a brief sidebar in the combat chapter about "playing with a grid" - but the grid never left this game. 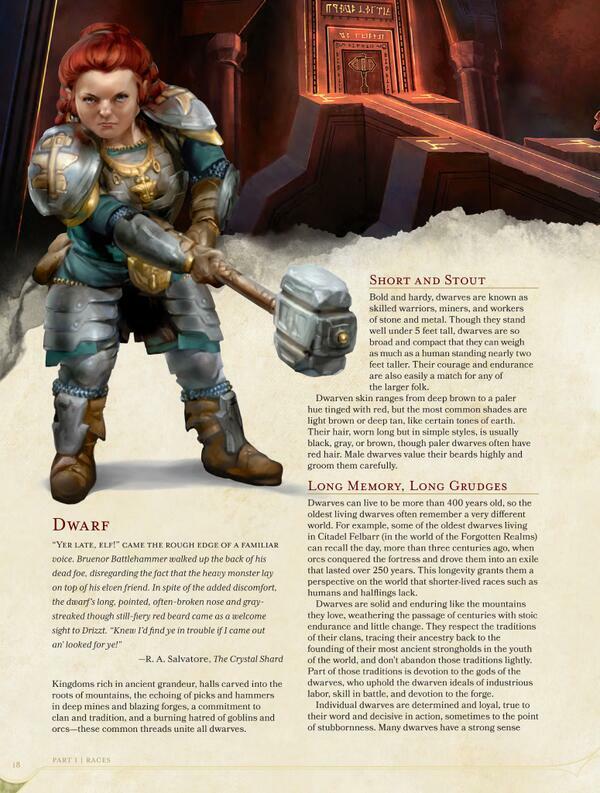 It's a game that cares too much about ranges and measurements - if it didn't would it really matter that a dwarf is 5 feet a round slower than a human? 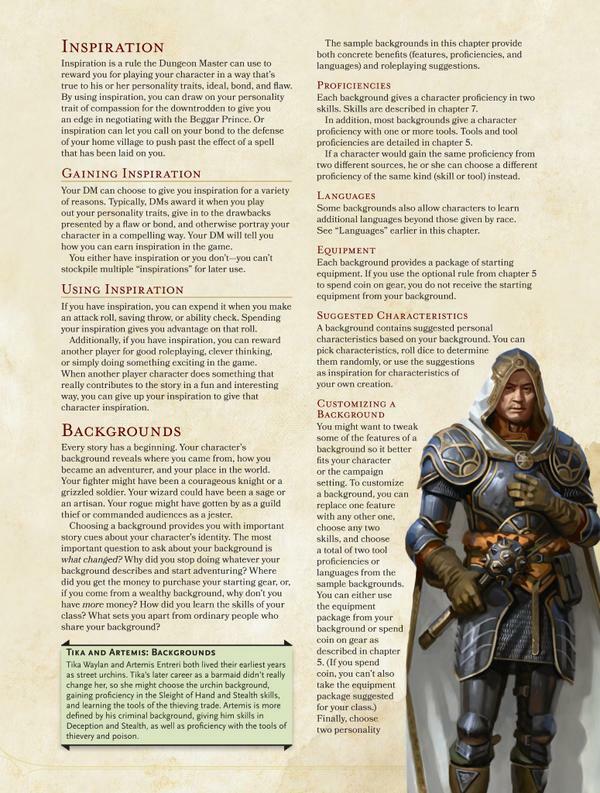 Without the promised grid rules, forthcoming in the Dungeon Master's Guide, the Player's Handbook just doesn't quite feel like a complete game. You'll probably end up fudging your rules for grid play together using the given guidelines and waiting for a copy of the DMG to arrive. In the end, this is a game that takes the idea of what D&D is and distills it. It's engrossing and has all the bits you want - the angry barbarians, the explodey magic guys - and the rules that go with them. It doesn't destructively reinvent D&D design, but it doesn't tear out old rules bugbears and play issues either. It's innovative for sure, blending some of the best lessons of the past decade of game design into a cohesive game that's not just fun to play but also feels fresh and recognizable. 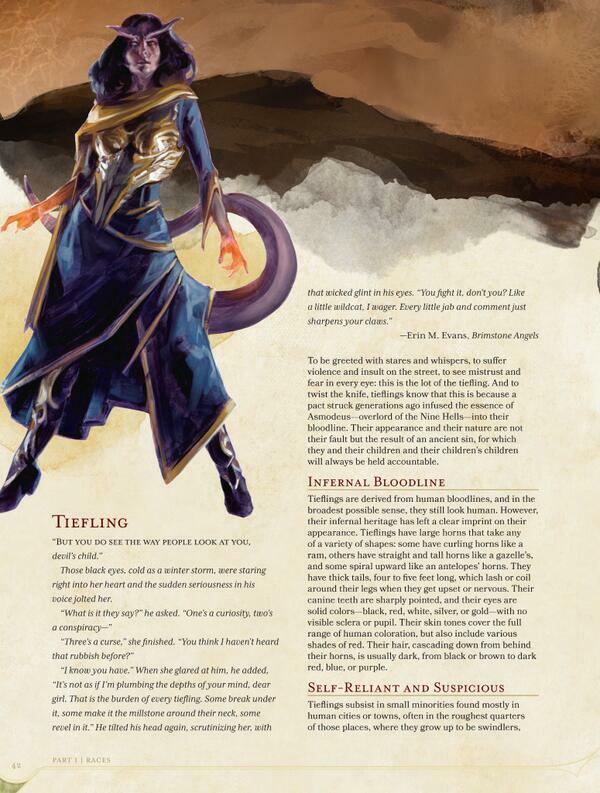 Wizards of the Coast have built a game that's definitely D&D - for good or for ill. There's respect for the legacy of the game here, but in giving that respect it doesn't innovate everywhere it should have. Bottom Line: You can't say that the new D&D is the best fantasy game on the market, but you can't find many games better than this. Recommendation: Faster, sleeker, and more fun. This is D&D-style fantasy play at its best. Ignore this game to your own detriment. Designed by Mike Mearls & Jeremy Crawford. For Dungeons & Dragons 5th Edition. Published by Wizards of the Coast. Released in 2014. Rodney Thompson, Peter Lee, James Wyatt, Robert J. Schwalb, and Bruce R. Cordell are also credited with design and development work.